Join EdUCate! 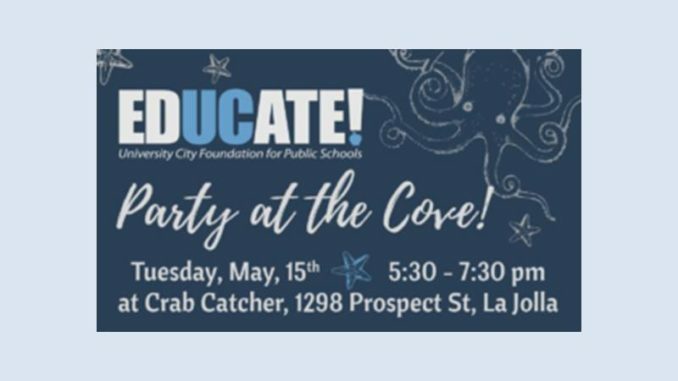 for a Party at the Cove at the Crab Catcher, a premier La Jolla Cove ocean view restaurant. Family owned and operated for over 35 years, Crab Catcher is one of San Diego’s best seafood restaurants. Auction: Preview items for the EdUCate! Spring Online Auction with the option to bid on items or Buy-It-Now. There will be special secret auction items available only at this party! The Online Auction will continue until Monday, May 23rd. Attire: Dress for a Party! Tickets: $35 in advance through May 11, $40 at the door. Ticket holders will receive 1 drink voucher with each ticket. Appetizers will be served. Note: EdUCate! is a nonprofit foundation established in 1993 to provide supplemental funds for all five of the University City Public Schools: Curie Elementary, Doyle Elementary, Spreckels Elementary, Standley Middle, and University City High School.